It is difficult to reconcile this supposed reassurance with the collapse of Carillion that happened, along with the criminal emptying of the company’s staff pension fund, without the government noticing anything amiss. The major difference between Capita and Carillion appears as one of degree, with new chief executive Jonathan Lewis viewing the wreckage of the instant corporate gratification model and resolving on immediate action. In contrast, the Carillion management soldiered on, aided and abetted by Tory government contracts thrown like lifebelts to keep it afloat. Management borrowed money to pay shareholder dividends while leaving a pension fund hole the size of the Grand Canyon. How could the auditing/accountancy transnational corporation KPMG give Carillion the thumbs up last year when its demise is so comprehensive and utterly unmanaged that the company can’t even fund the liquidators, dumping a £50 million bill on taxpayers? The board appears to have pursued a scorched earth policy to transform all tangible assets into dividends while fleecing employees, pensioners, creditors and suppliers. Capita has not followed Carillion into that black hole, but its operating model is similar, growing into a sprawling ungainly conglomerate and aiming to maximise short-term shareholder value over long-term considerations. Above all, both Capita and Carillion, along with the whole gamut of large outsourcing outfits, have depended excessively on contracts with central and local government, the NHS and other public corporations. This model, based on contracting out previously in-house services from cleaning, catering and construction to payroll and personnel sections, was driven originally by 1980s Tory governments to cut pay levels and reduce trade union influence. Private-sector efficiency and expertise were the buzz words deployed to sell what was essentially privatisation. 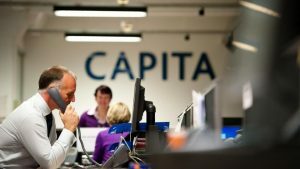 Capita’s financial decline, with its shares plunging over 40 per cent to a 15-year low, its profits warnings and its decision to try to raise £700 million through an emergency rights issue of shares, may do the job that new boss Lewis wants, but that is not the major issue. As Carillion has shown, when these private companies sink below the waves, they take workers’ jobs and pensions with them and create problems for the public-sector areas forced into their arms. The Trades Union Congress (TUC) demand that the government carry out an “urgent risk assessment of all large outsourcing firms” is understandable, but a more root-and-branch position is necessary. Even if the current government accepted the TUC demand, the likelihood is that it would engage KPMG or similar to carry out such assessments. Unite’s opposition to Lancashire County Council’s decision to hand a £104 million five-year contract for youth health services to Richard Branson’s Virgin Care hits the bull’s eye. There has been a public mood change in recent years that Labour is catching up with, as the campaigns for public ownership of rail, utilities and Royal Mail have demonstrated. This is no longer the 1980s. People are no longer seduced by myths of private-sector efficiency and reliability. It’s time to declare an end to the outsourcing fiasco.